Source code is available here via SVN with username = "opensource", password = "123456". The project is cross-platform, based on QT. Server-side is based on ASP.NET web forms and MSSQL. Optionally specify parameters of UDP streams. 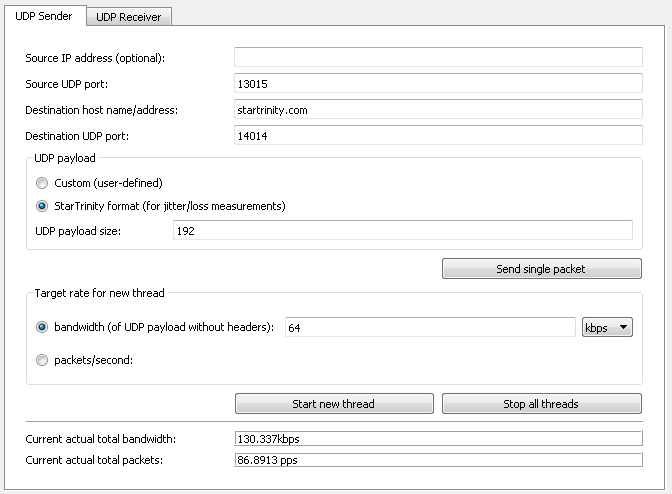 "Number of packets to send per period" setting correspond to number of calls. Default parameters are for 100 parallel G.711 calls. Enable senders and receivers. It is OK to enable only one receiver and one sender. Run the test and obtain characteristics of your IP network. The test can be performed during 24-hours so you will get maximum jitter for this period.